Ask Willie Stylez - The Blog! : Reverse, Inverted & Eamz Heels... What's the fascination??? 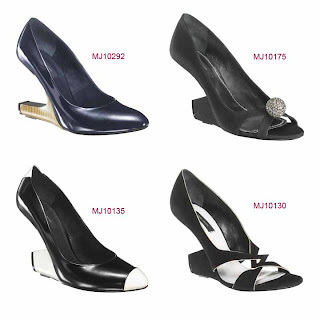 Reverse, Inverted & Eamz Heels... What's the fascination??? Reverse, Inverted & Eamz Heels... very fascinating??? I was recently checking out a blog posting, from English Russian, and noticed the shoes this photographer had on (No Homo!). And being an avid shoe admirer, especially heels (once again, NO HOMO! LOL! ), I felt like I needed to see what the possibilities were! So, struck by the unique (or so I thought) and interesting design, I decided to Google it! And what I found was a plethora of designs and styles that have apparently be released for some time now (reportedly, up to 5 years ago!). Apparently even the innovative design studios at Marc Jacobs has even tried their hand at it. But maybe without the best results! Below you will find some more variations. Unusual dedication to LeVar Burton! WOW! The Twit-Book Hiatus! A Seven-Day Adventure!